The High School Culinary class recently hosted Soup's On at Blackville School. The class served lunch to more than 80 people who came out to participate in the community luncheon program. The menu consisted of homemade chili and biscuits. The program, hosted by the Greater Blackville Resource Center, ran for ten weeks on Tuesdays. Blackville School hosted on April 11. Lunch was free, however a good will donation could be made at the door. 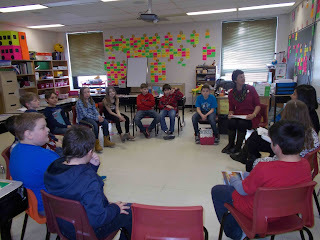 The program worked with the Blackville Health and Wellness Committee to host a guest speaker at each event. 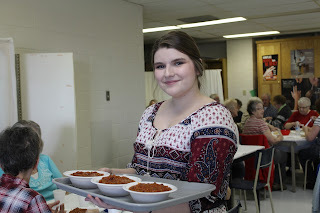 To see more photos from Soup's On at Blackville School, click here. To learn more about the program, click here. Grade 4 students had an opportunity to learn more about First Nation culture when special guests visited the school on March 28. Katrina Claire and Elizabeth Price gathered with both grade four classes and shared First Nation legends with the students. This talk was also accompanied with drumming and song. Ms. Claire and Ms. Price work in First Nations Education for the Anglophone North School District. To find out more, click here.